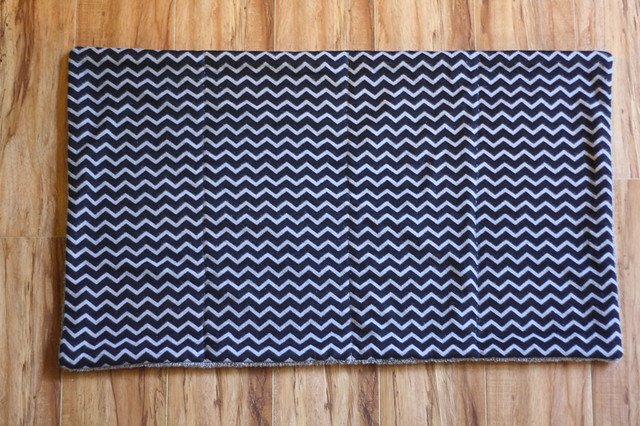 Weighted blankets are beloved by those with sensory issues, anxiety, joint pain, and folks on the autism spectrum. They are expensive to buy, but pretty simple to make. 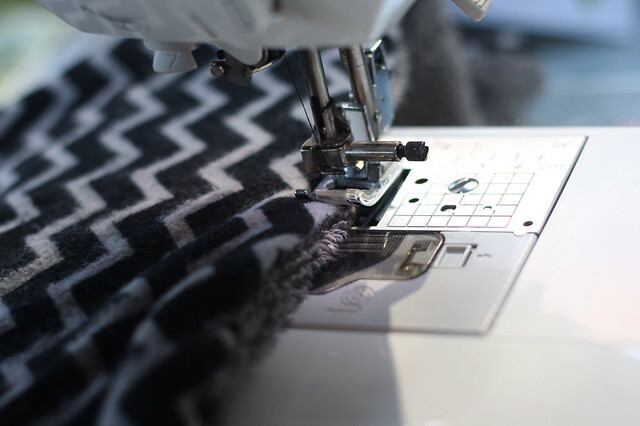 Here’s how I made an adult-sized blanket for a friend who suffers from joint pain. My friend is 5’2″ and weighs 148lb. The blanket measures almost 4 feet by 6 feet, and ended up weighing 24lb, which is a bit more than 15% of her weight. Note: wrangling 24 lbs of blanket is a workout. 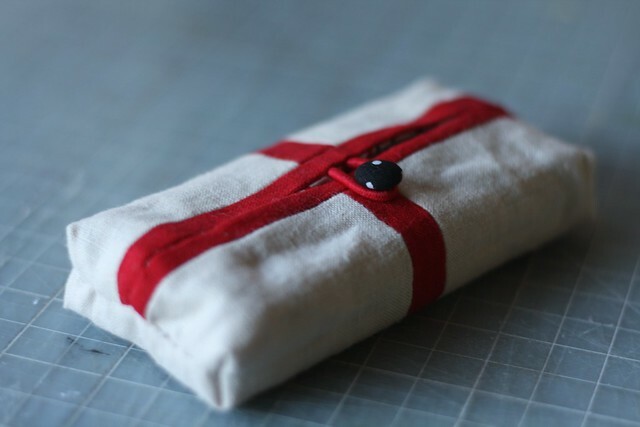 You will not need to go to the gym on the day you sew this. 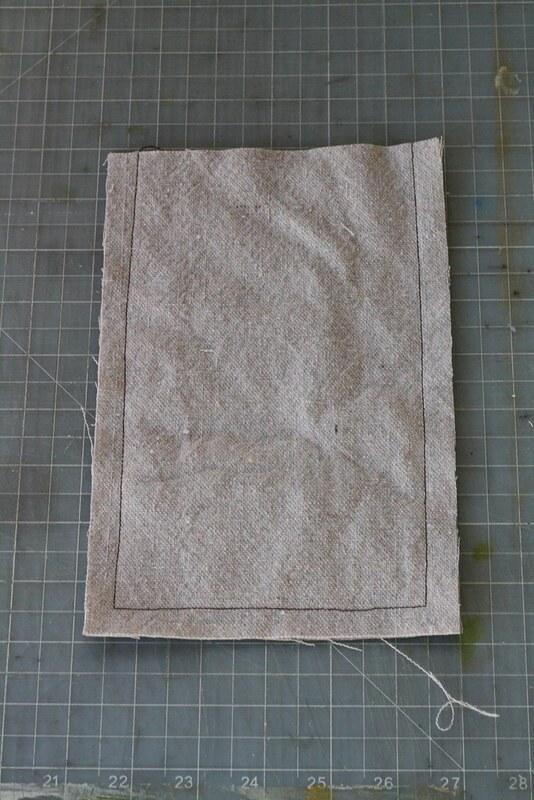 • A canvas drop cloth from a hardware store for the internal bags of pellets. 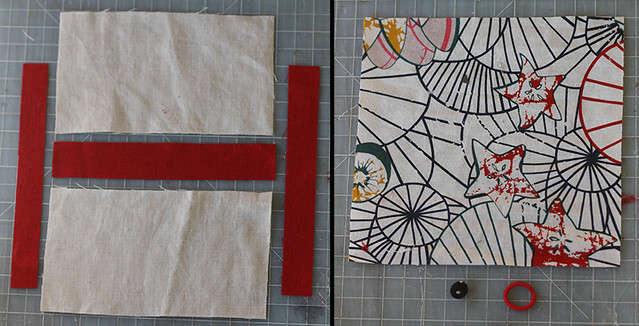 It wasn’t quite enough fabric to complete all the bags, so I used a heavyweight cotton tablecloth for the last few. All up, you’ll need about 4 yards of heavyweight fabric. It doesn’t matter what it looks like, because it will be completely enclosed in the finished blanket. 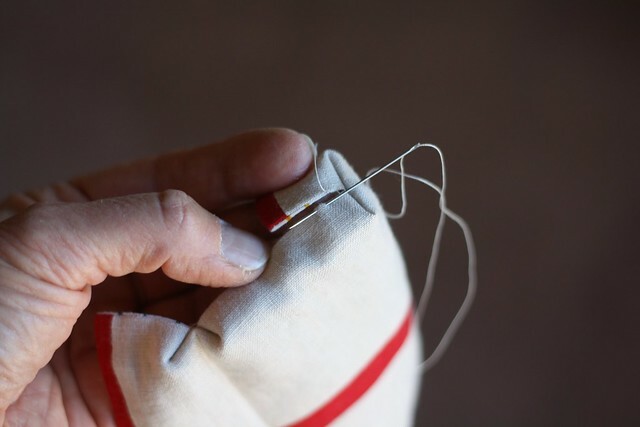 • Strong sewing machine needles. I went through four needles making this blanket, so have spares on hand. 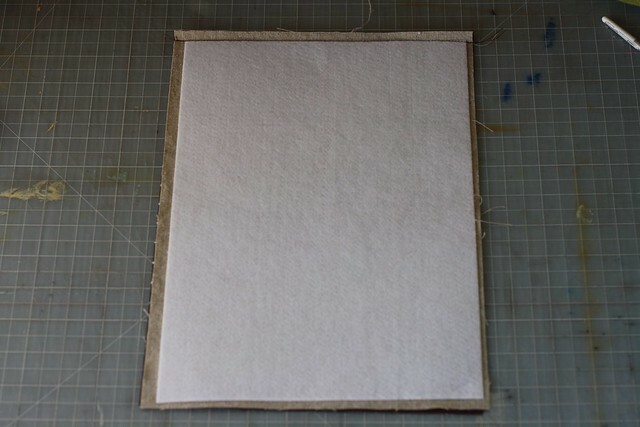 Cut 128 rectangles measuring 5.75″ x 8.75″ from the canvas. 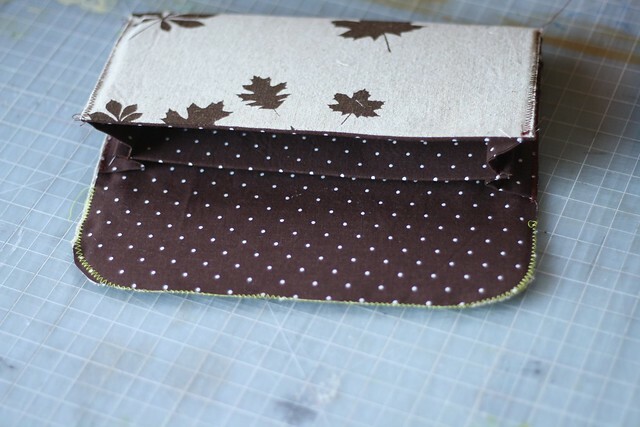 Take two rectangles, and stitch along three sides, using a 1/2″ seam allowance. No need to backstitch at the ends. Do not turn right side out! 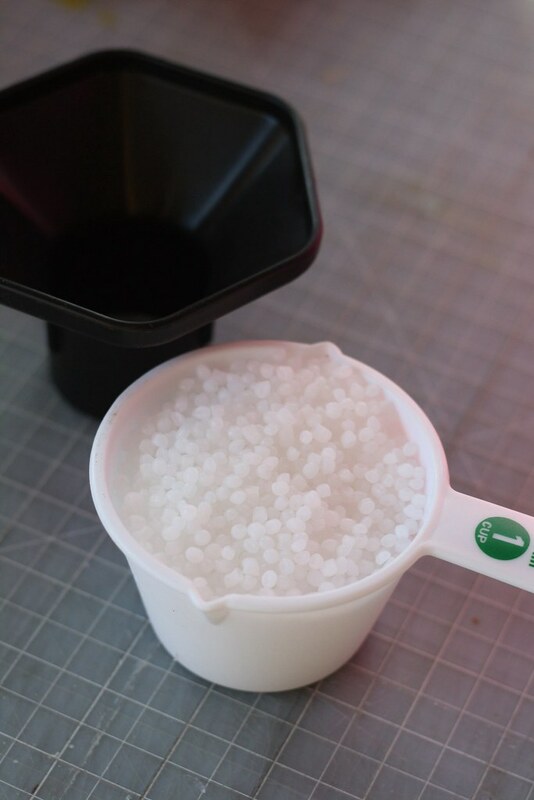 Leave it with the seams on the outside, and fill it with 1 cup of poly pellets. 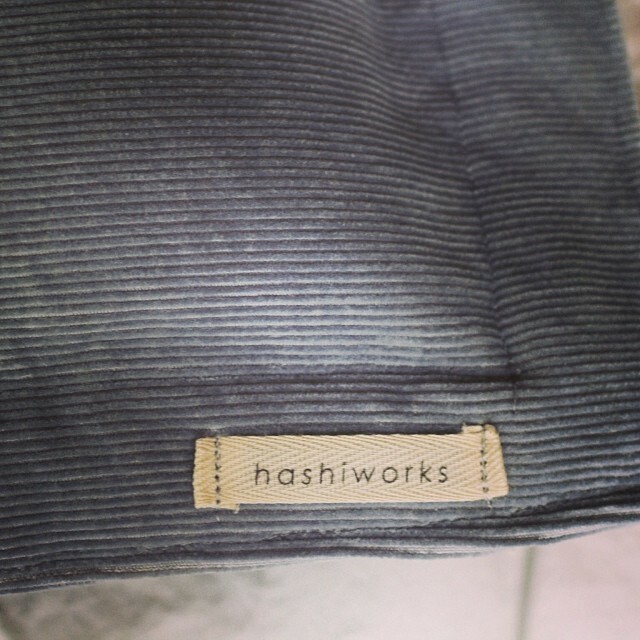 Stitch the bag closed with a half inch seam allowance. Be careful to shake all the pellets away from the sewing line. They will break your needle if you stitch on them! Repeat for the remaining 63 bags. 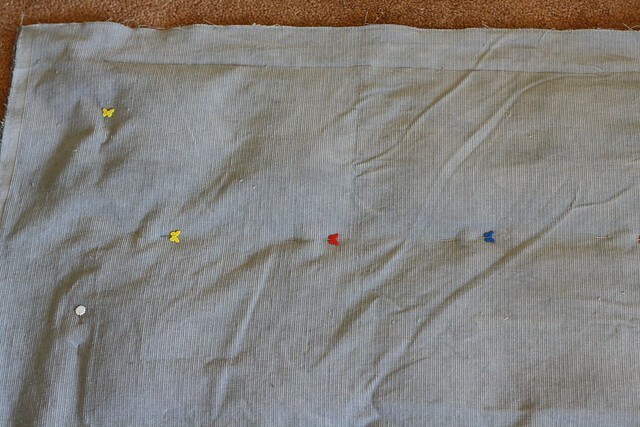 Pin two bags with a long edge overlapping. 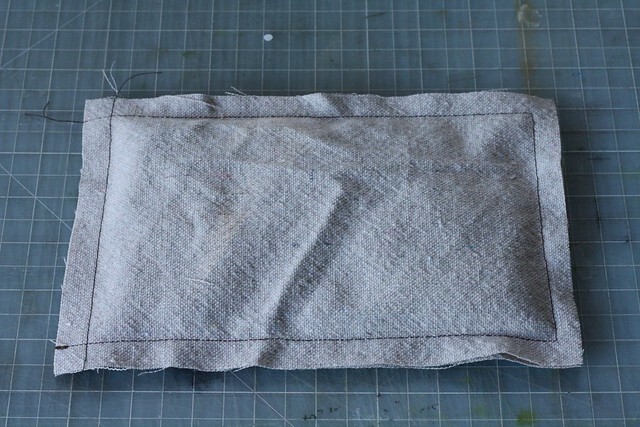 The edge of one bag should line up with the stitching line in the next. 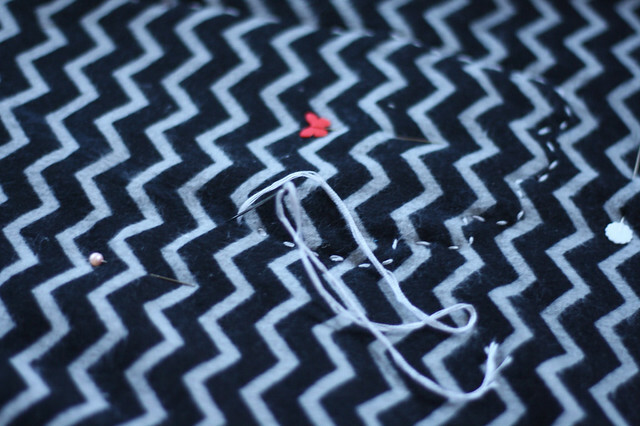 Join with a zig zag stitch. Repeat till you have a row of eight bags joined together. Then make seven more rows, ending up with eight rows of eight bags. Have a rest for a while. 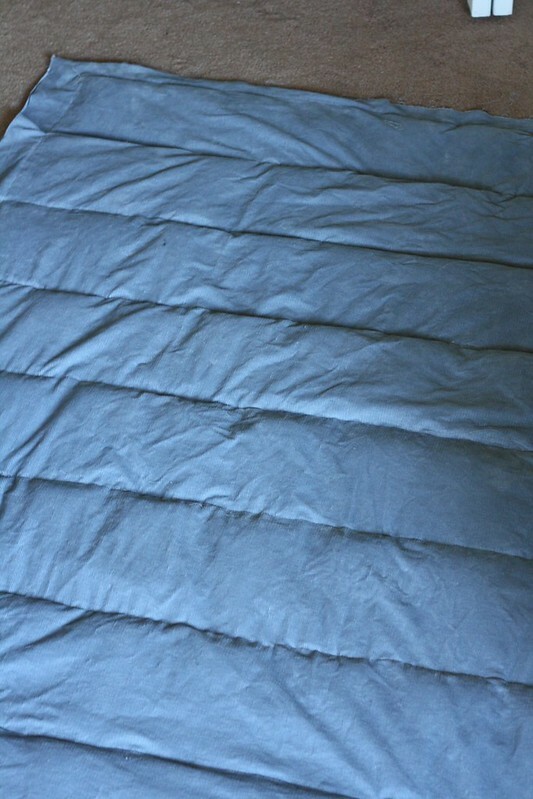 Cut two pieces of corduroy 48″ x 72″. With wrong sides together, zig zag the two pieces together along one short edge. Open so that the fabric lies flat on the floor, right side down. 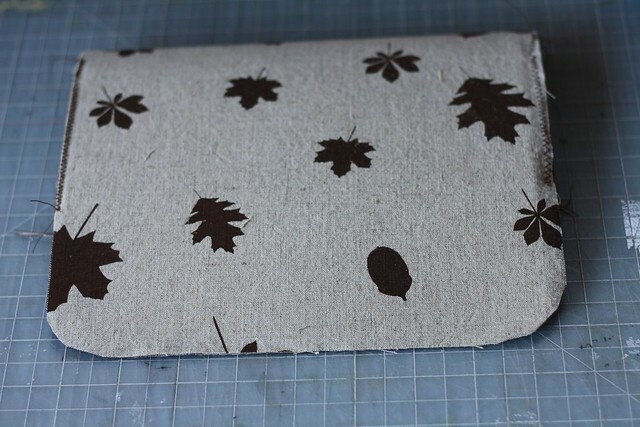 Lay one row of pellet bags about 3″ from your zig zagged seam, and centered left to right. Smooth everything out, then close the corduroy back over the pellet bags, enclosing them. 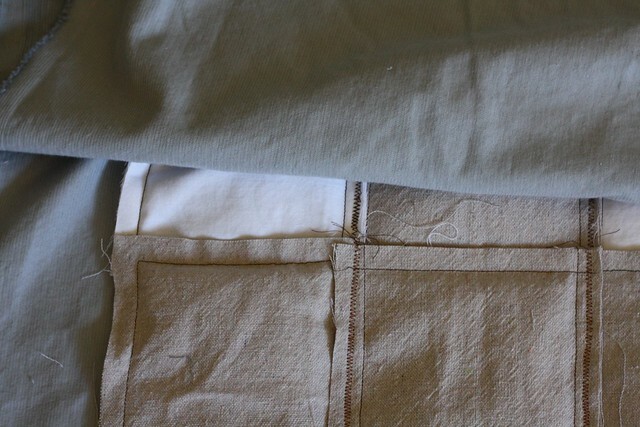 Pin through the half-inch seam allowance at the top and sides of the row of pellet bags, catching both front and back corduroy pieces. 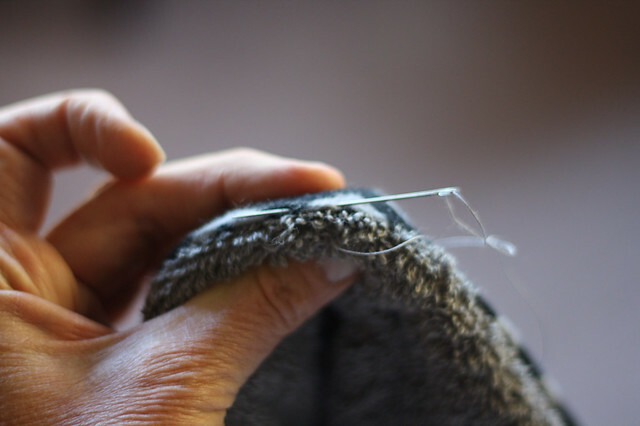 Stitch through all layers, parallel to the short edge, with a slightly lengthened straight stitch. 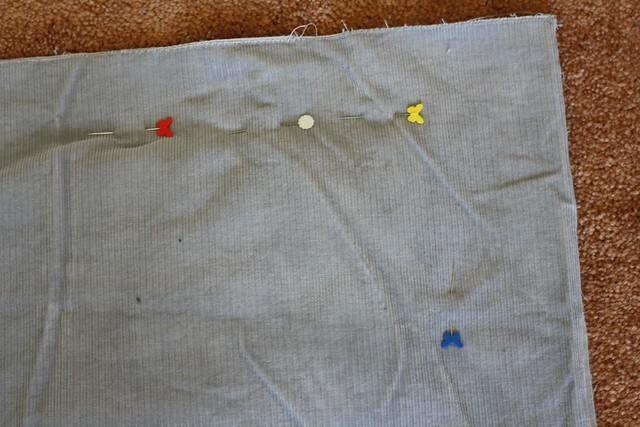 Don’t stitch all the way to the edges of the corduroy; stitch only the length of the pellet bags. 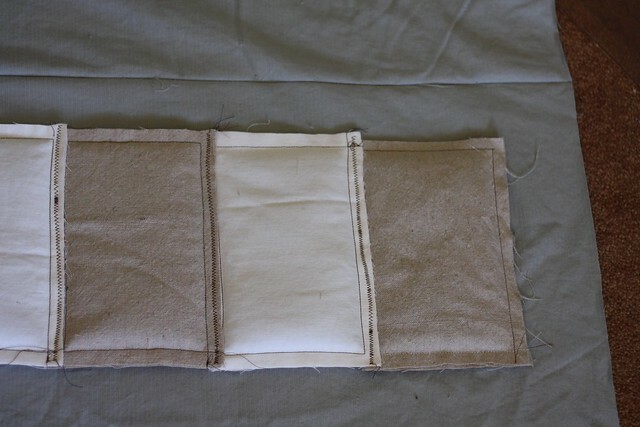 Lay a second row of pellet bags inside the corduroy ‘sandwich’, overlapping seam allowances with the row above. 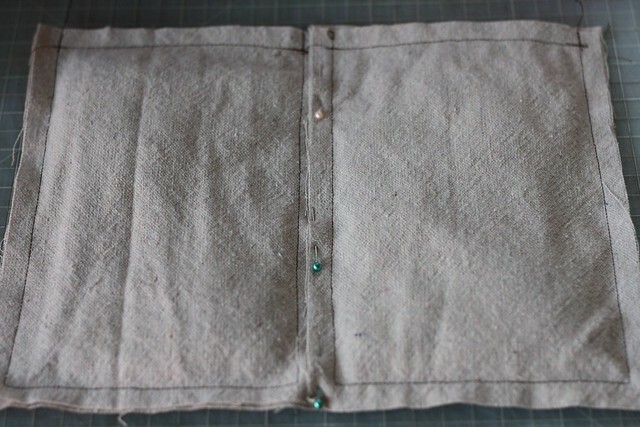 The edge of the second row should line up with the stiching line on the first row of bags. 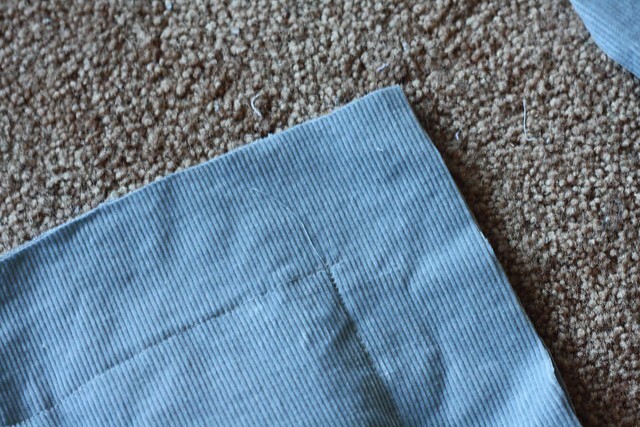 Flap the corduroy closed again, smooth everything out, and pin through all layers along the overlapped seam allowances. 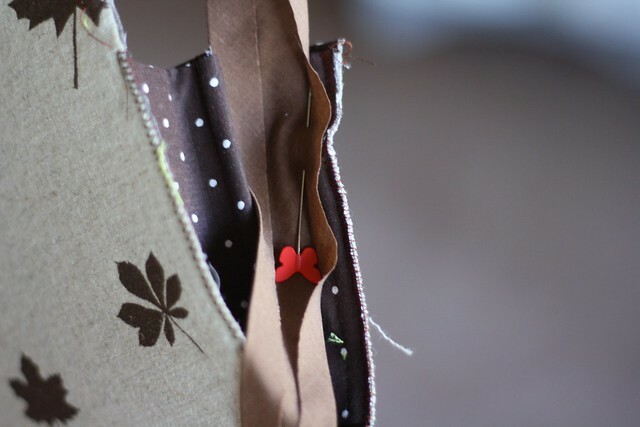 Continue in this manner, adding rows of bags and stitching through all layers. 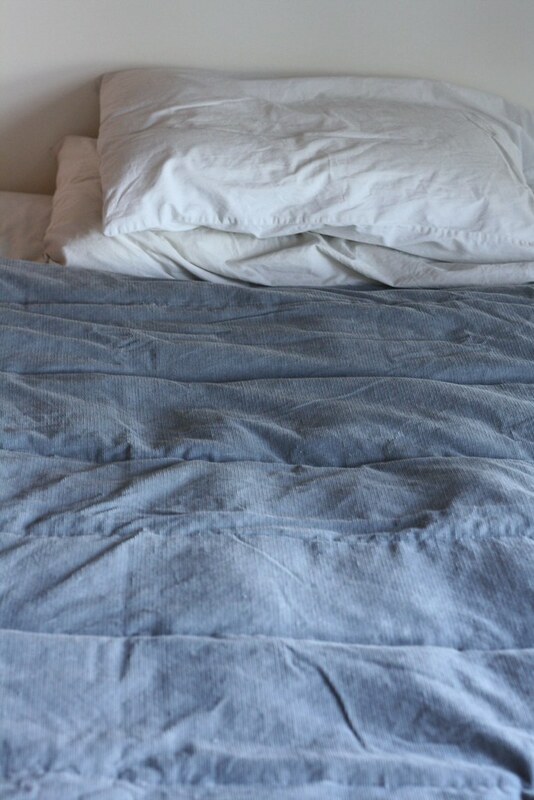 You will need to roll the unfilled side of the blanket and keep it to your right as you sew. The more rows you add, the heavier and more cumbersome the blanket becomes. Go slow and steady, taking stretch breaks as needed! 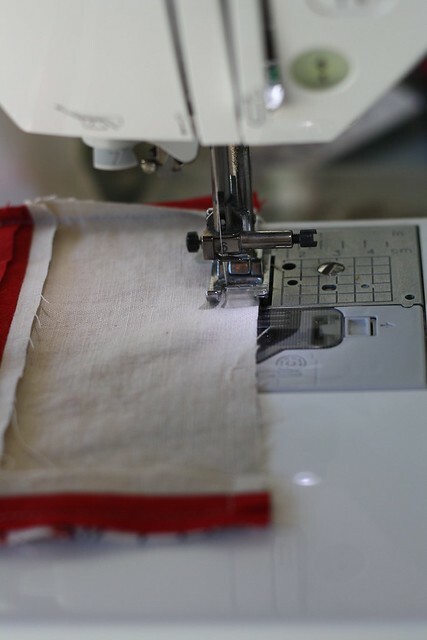 When all eight rows have been stitched into place, sew down the left and right sides, catching those bag seam allowances. 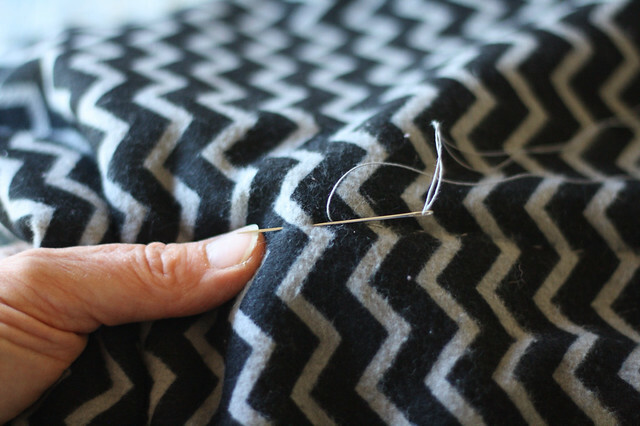 Trim the blanket to 2″ wider than the outer stitch lines. 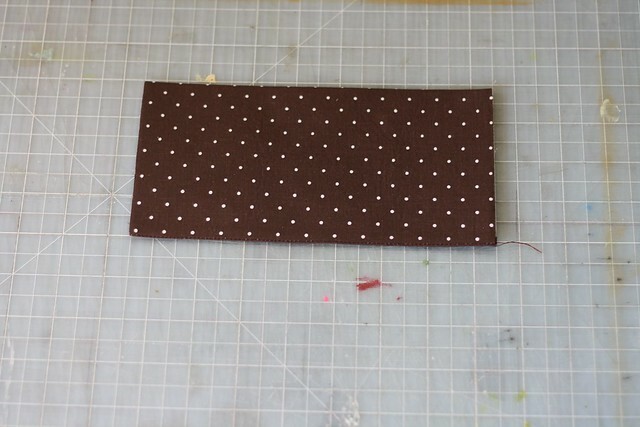 Turn each edge under, creating a border 1″ wide. Top stitch close to the edge all the way around, mitering the corners as you go. Attach your label! You’re done! 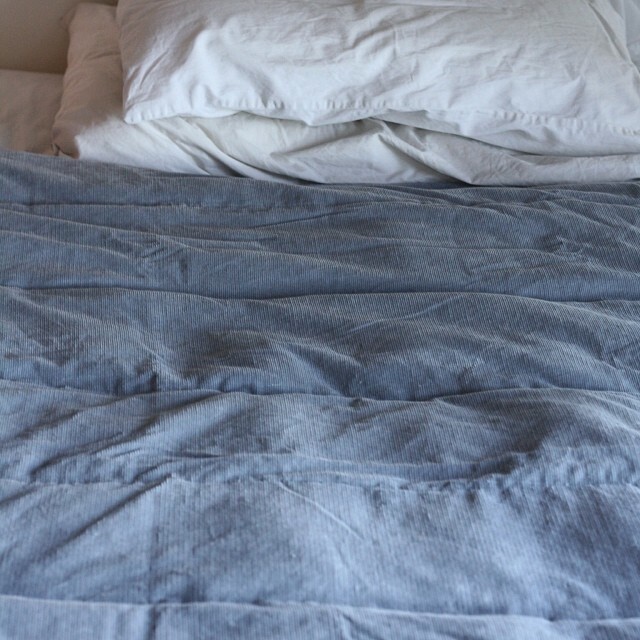 After three nights under this blanket, my friend reported: “I have been sleeping just so well, I couldn’t have anticipated such a difference. It’s been magical!” Hmm, maybe I need a magical blanket for myself! 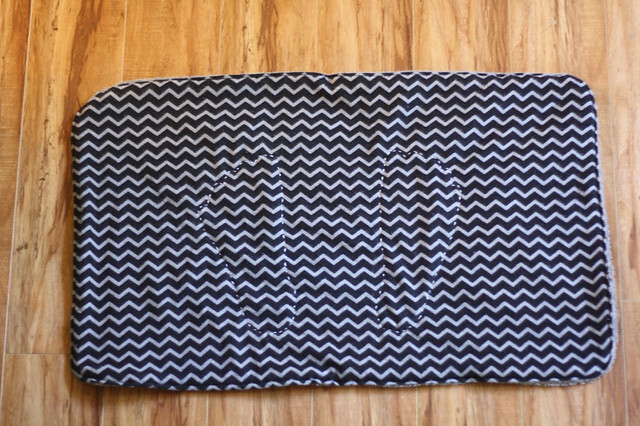 Here’s a super simple bath mat that can be customized for your recipient. It’s even — gasp — suitable to give a guy. Better yet, all it takes is a towel from the sale bin, plus a yard and a half of flannel, to make TWO. Wash and dry your towel and fabric on high settings, to get maximum shrinkage. 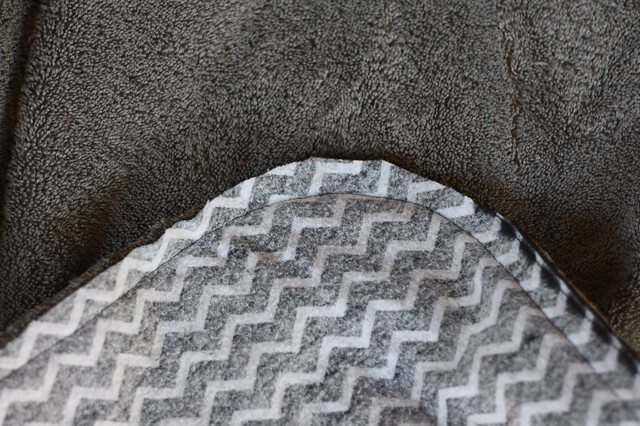 If your towel has woven band near the ends, you’ll see how much it shrinks! Cut off the bands, then cut the remaining towel in half. 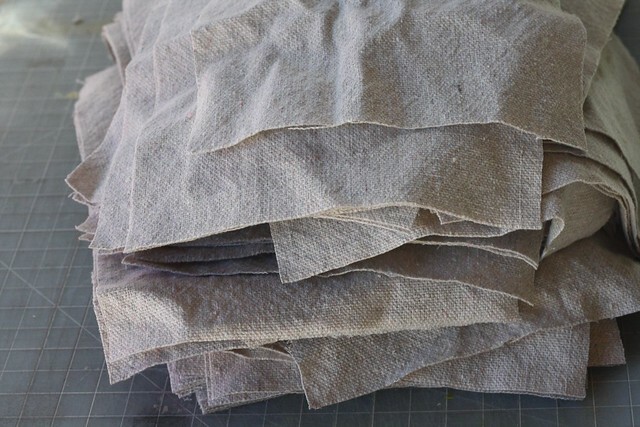 Cut flannel the same size as your towel pieces, then pin one piece of each right sides together. 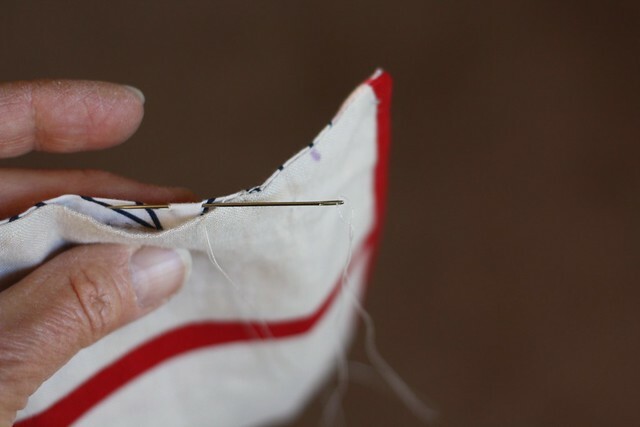 With a good half inch seam allowance, stitch around the edge, leaving about 8″ unstitched in the middle of one long side. 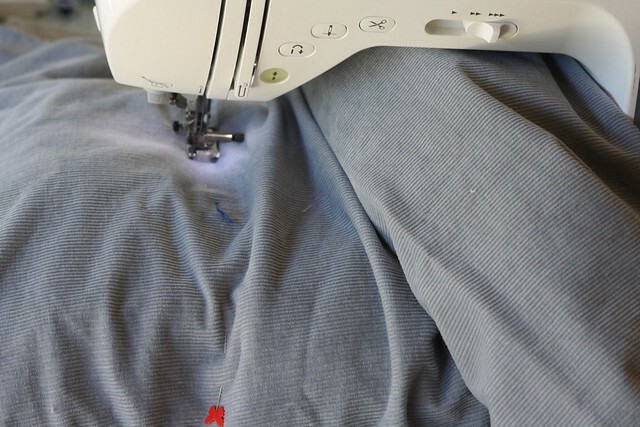 Tip: to avoid accidentally sewing the gap closed, mark start and finish points with two pins. 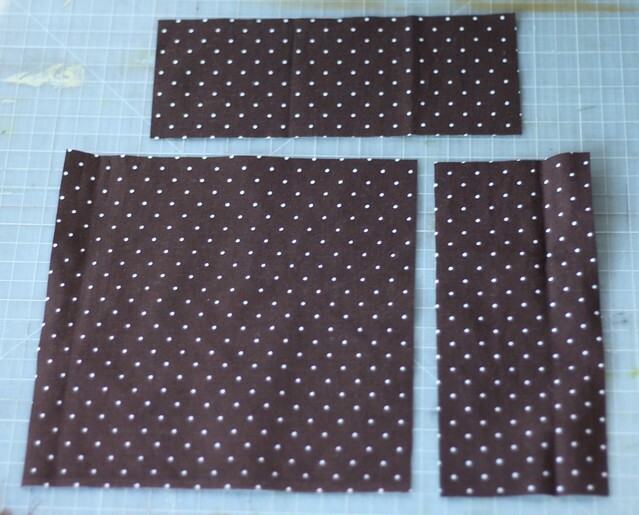 If you want to, round the corners as you sew, then trim the fabric back to match the rest of your seam allowance. If not, clip your corners. Turn right side out. Version 1: stand on the mat and trace around your feet with chalk or a soluble marker. 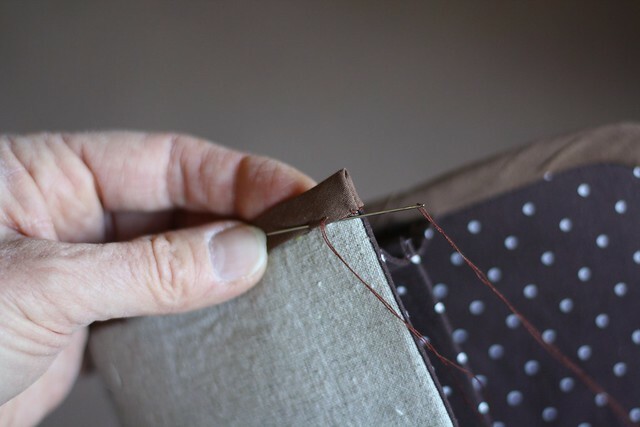 Using six strands of embroidery thread, outline the feet in running stitch. 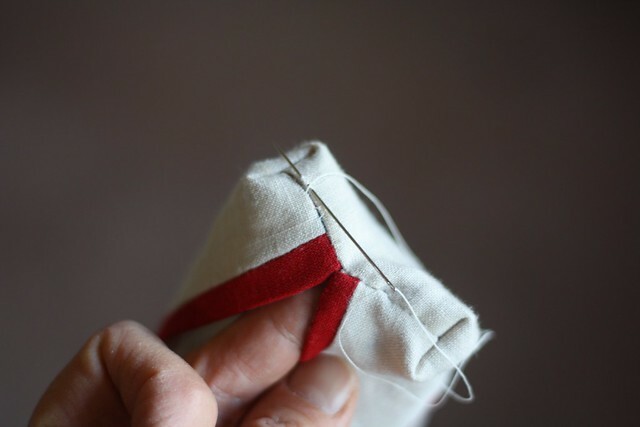 To start, knot the end of the thread then insert the needle between the two layers, through the still-open gap. This way the knot will be in the inside of the mat. Finish off in the same way. Version 2: with chalk or soluble marker, draw lines at the quarter, half, and three-quarter marks, going from top to bottom of the mat. Thread a needle with strong thread (I used Coats Button and Carpet thread). 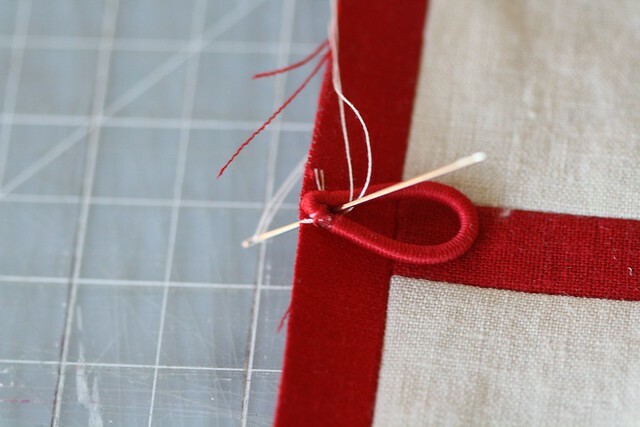 Sew a row of running stitch along each line. 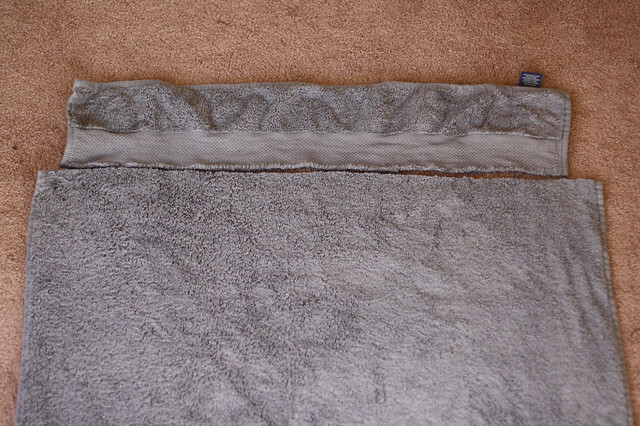 Again, place your start and finish knots on the inside of the mat, between the two layers. Optional: increase your stitch length and top stitch all around. 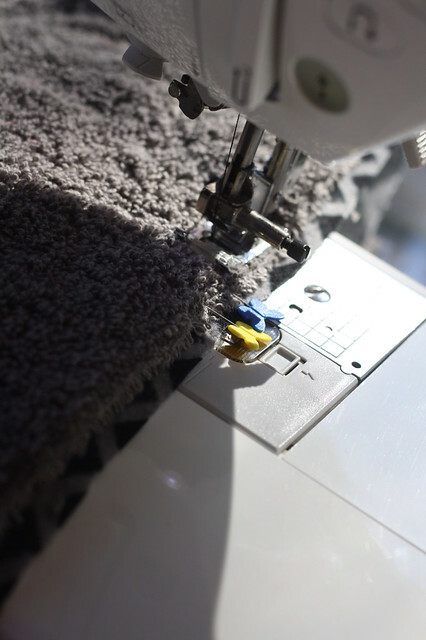 Then vacuum your floor and sewing machine to get rid of all the toweling fuzz! I’m not a big coupon cutter, but I do like to use the discounts at Joann and Ralphs, the two stores at which I spent the most money, it seems. 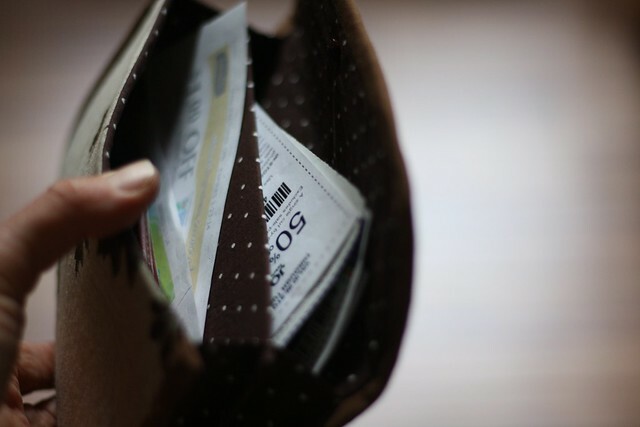 They mail me coupons which I stuff in an envelope in my handbag. But with all the other crap in there, the envelope gets torn and ratty pretty fast. So I decided to make myself a little wallet/clutch thingy, divided into two sections, for stowing these useful bits of paper. Want to make one too? Here’s how. 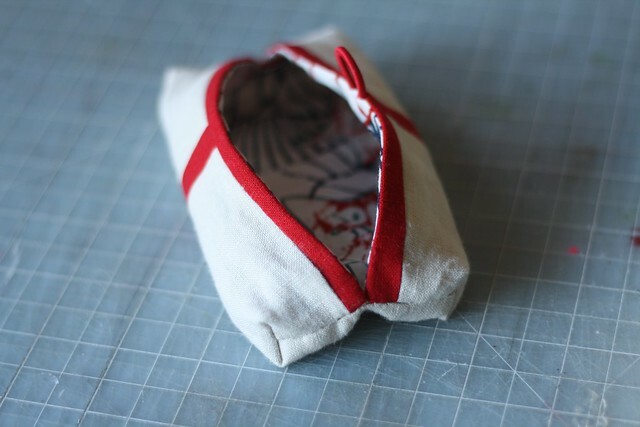 1/4″ seams are used throughout. 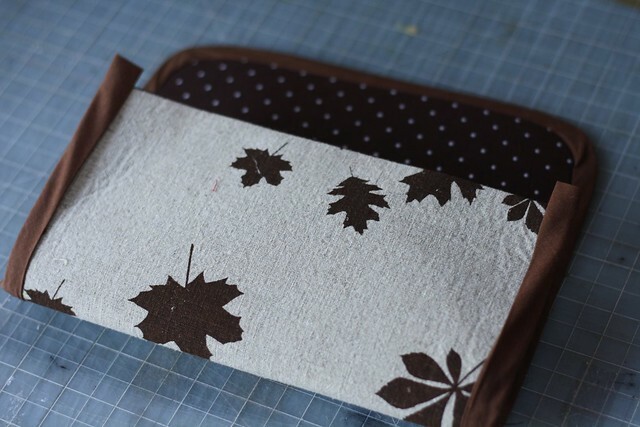 Fold the divider piece in half so it measures 8″ x 4-1/4″. 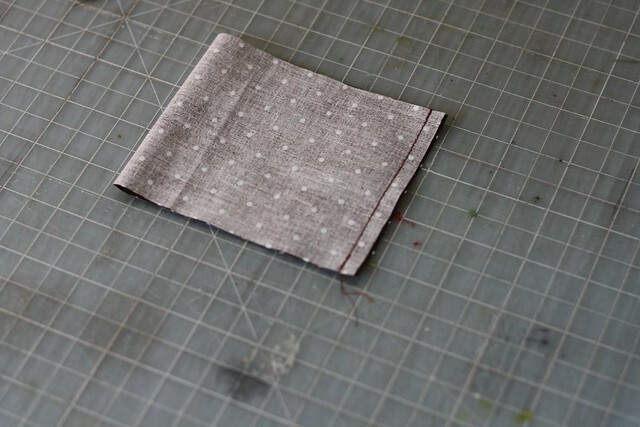 Using the fold line as a guide, fuse your smaller piece of interfacing to one half, butting up against the fold. 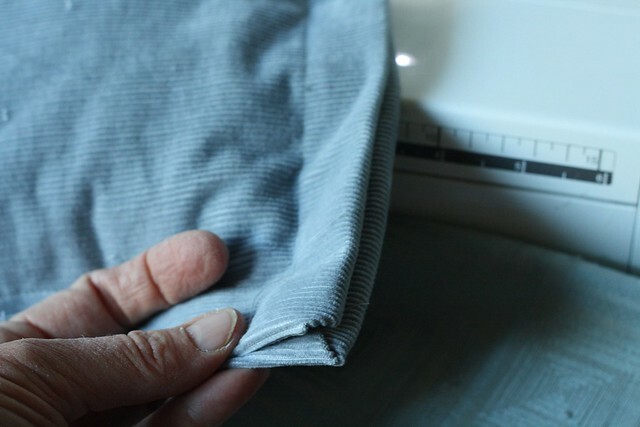 Fold the fabric right sides together, and stitch the long edge with a 1/4″ seam, right at the edge of the interfacing. Turn right side out and press well. 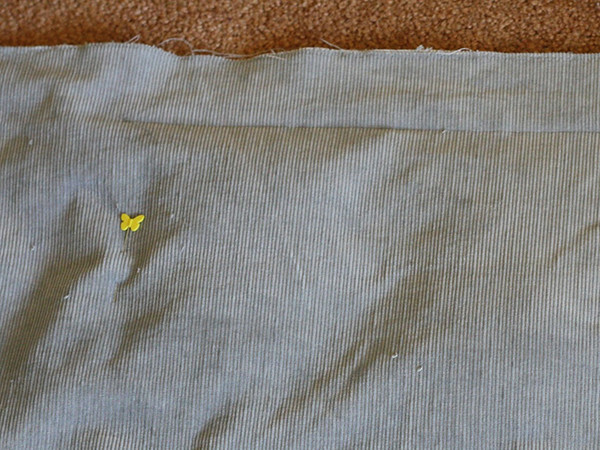 Center the larger piece of interfacing on your outside piece of fabric. Fuse. 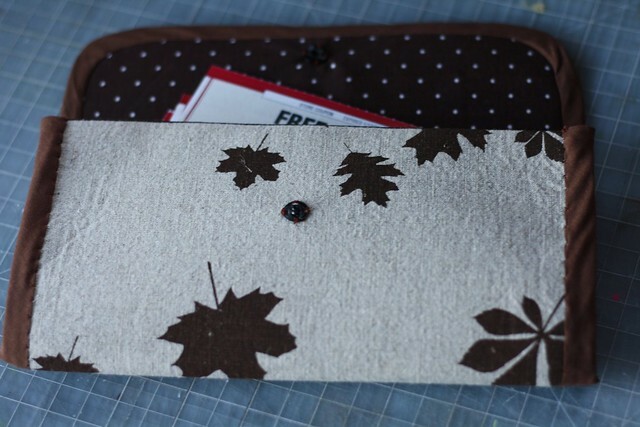 Place right sides together with the lining, and stitch along one short edge. Turn right sides out, and press well. 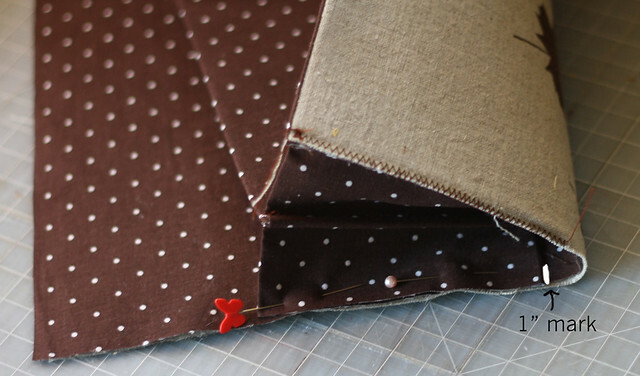 Take one of your accordion pieces, and fold right sides together so it measures 4-1/4″ x 3″. Stitch along short edge. Turn right sides out, and press well. Sandwich one end of the divider into the fold of one accordion piece. 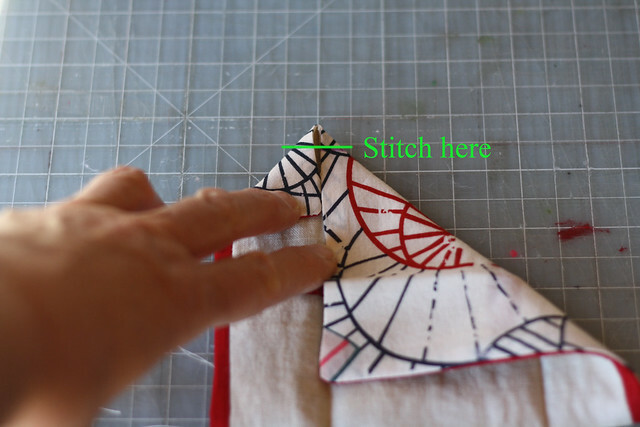 Stitch 1/4″ from edge. Repeat at other end of divider with remaining accordion piece. Place the outer piece with lining side up. 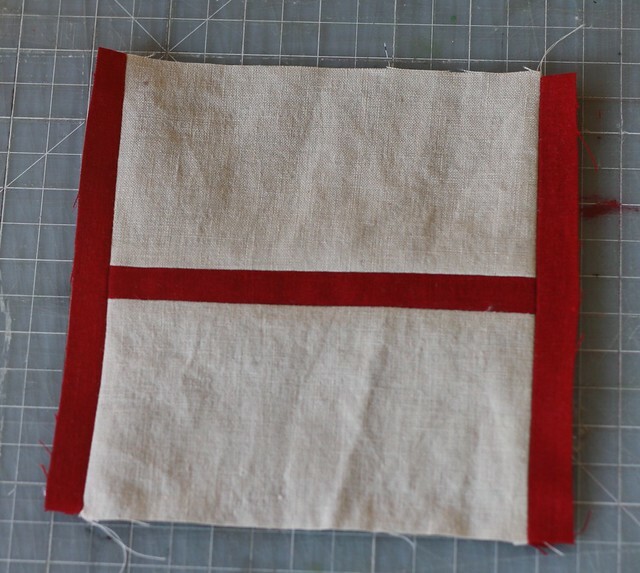 Place the divider on top, lining up one of the loose accordion flaps with the side edge, right at the folded edge of the outer piece. 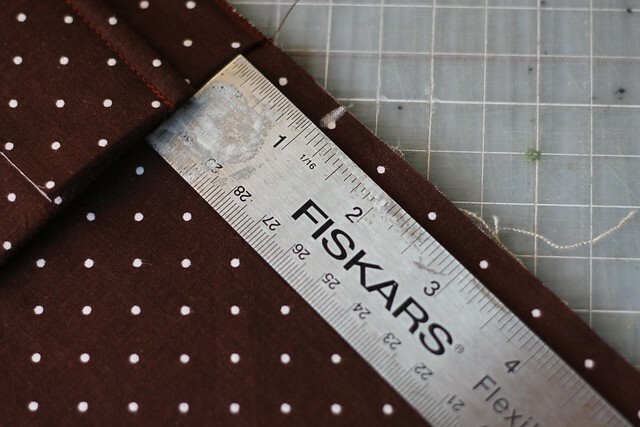 Measure one inch from edge of divider, and make a mark on the lining at side edge. The bottom of the other flap of this accordion piece will line up with this mark. Line up the edges of the lining and flap as shown. Pin, then zig zag to secure. 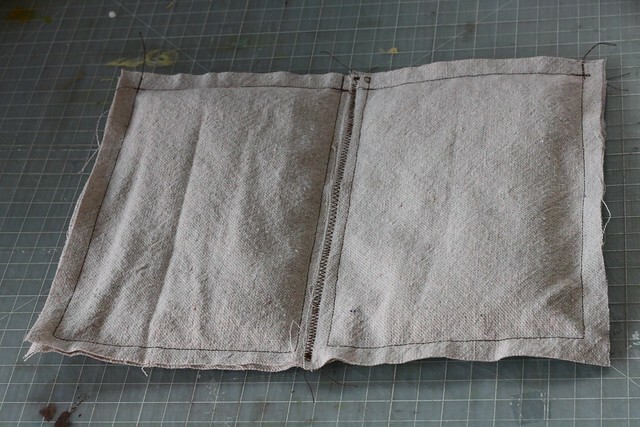 Repeat with the other side of the divider, attaching the flaps to the edge of the outer piece. 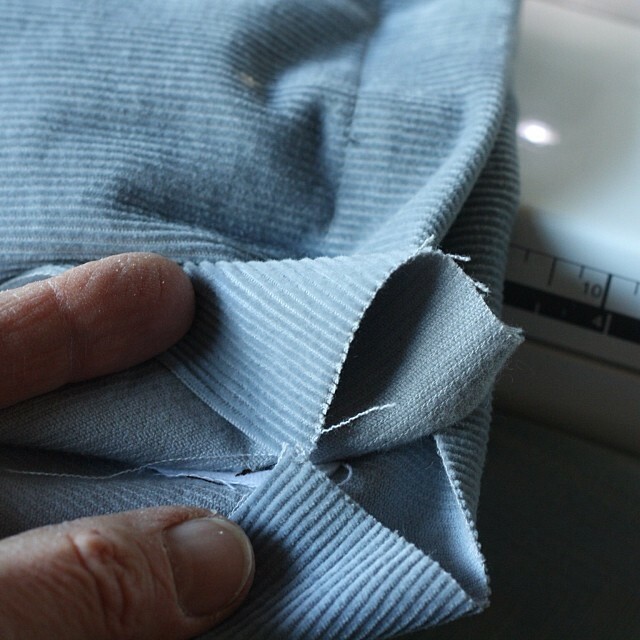 With the outside facing up, check to see if your outer fabric and lining fabric still align. 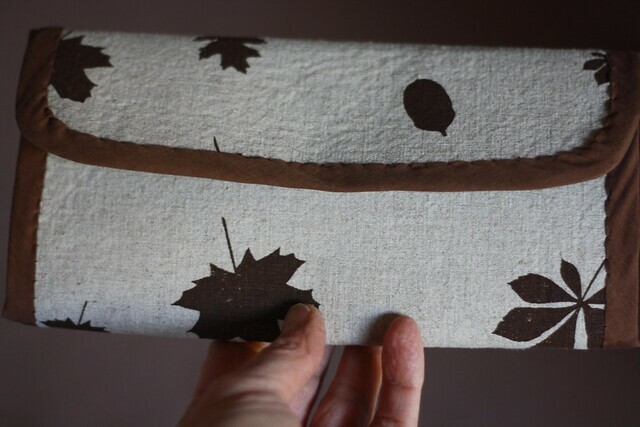 If not, trim back the lining to match the outer. Using a suitable round object (I used my lens cap), trace curves onto the corners of the flap, then cut them. Zig zag around this edge to keep the layers together. 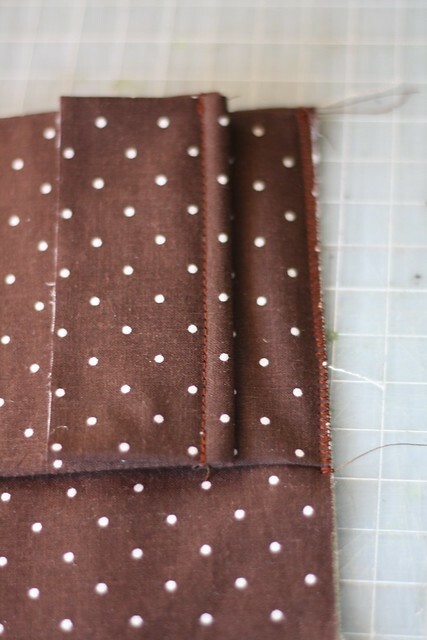 Starting at the front edge on the accordion side, attach the bias binding. 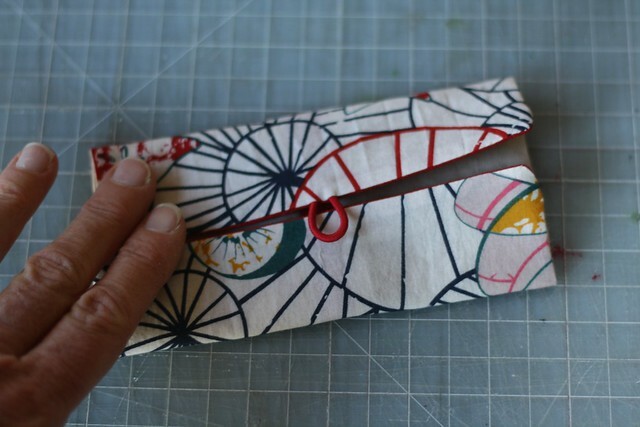 Allow the binding to extend past the edge by 1/2″. Stitch slowly; getting round the bottom curves is tricky. 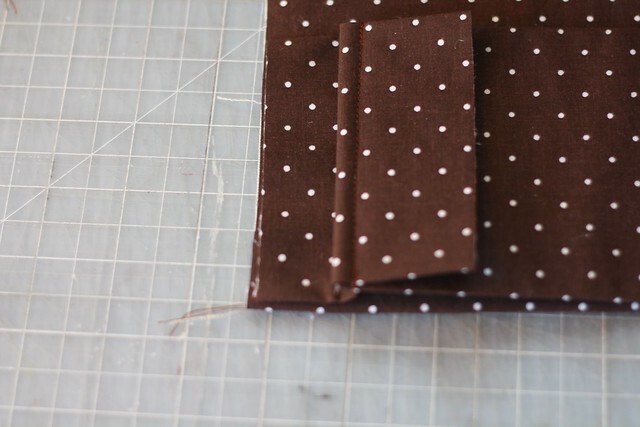 When you get to the end on the other edge of the front, cut the binding about 1/2″ longer than your sewn seam. 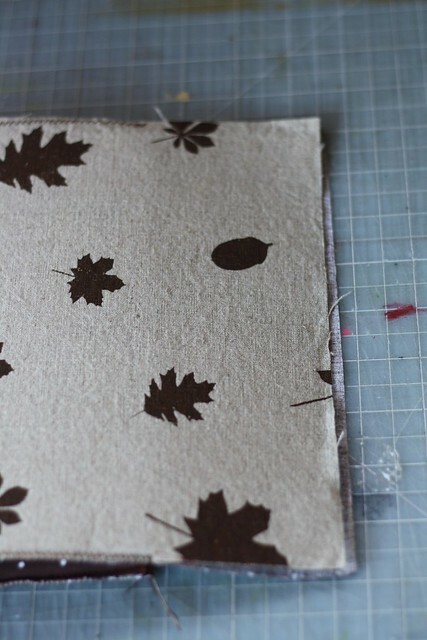 Fold the binding to the outside; press. 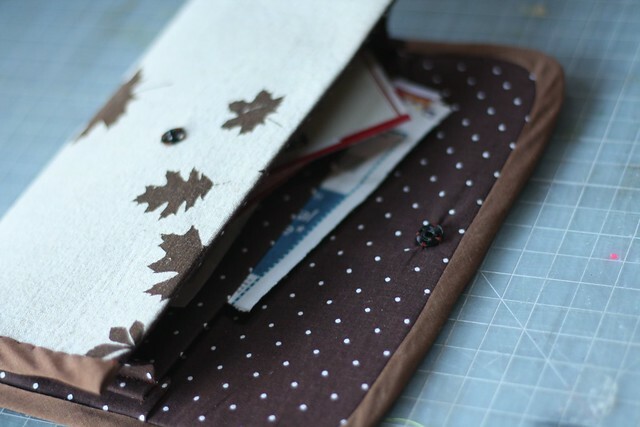 Slip stitch the binding to the outside of the wallet, tucking in the start and finish ends as you go. If you want to attempt this step on the machine, go for it. I just knew I’d get a nicer finish if I hand stitched it. 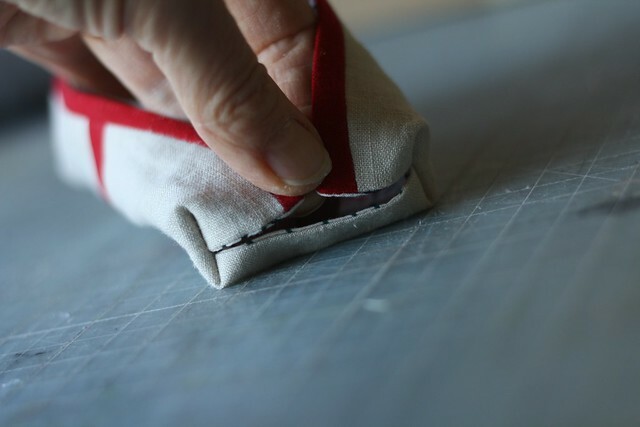 Attach one or two snap fasteners, sewing only through the top layer of fabric and interfacing. I saw this movie last night. It was intense, beautiful, lyrical, confusing, nauseating. Nasty and engrossing and poetic. 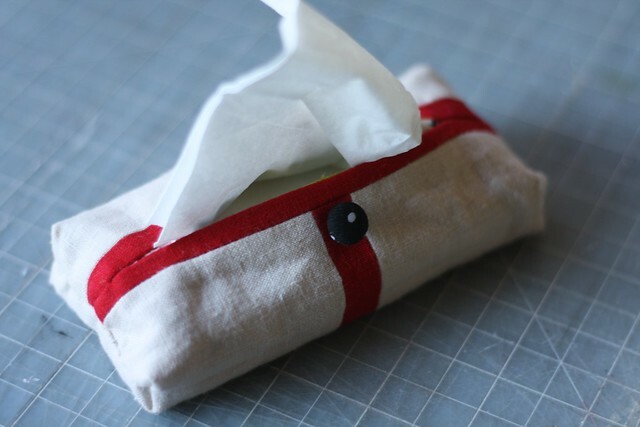 I know there’s really quick and easy ways to make mini tissue holders for your purse. This is not one of those tutorials. 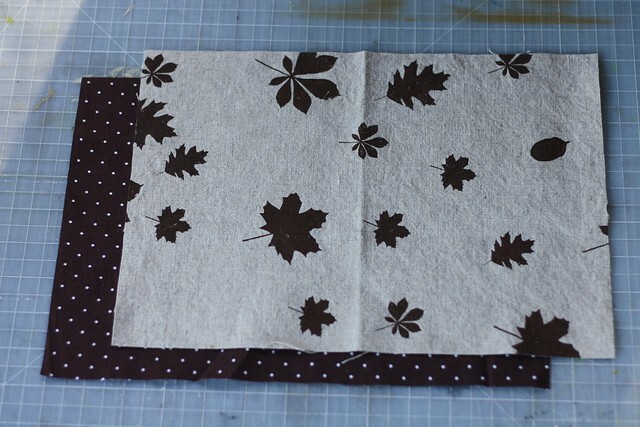 This is a slower method that requires piecing and a bit of hand stitching. 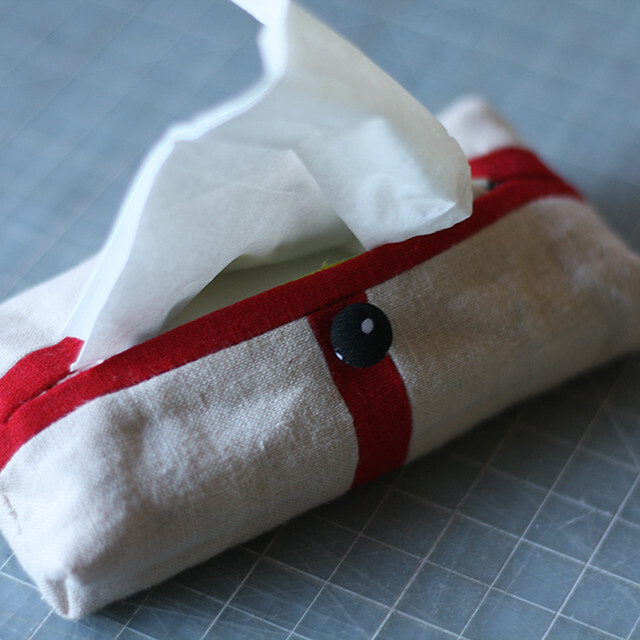 Think of it as the Coco Chanel of tissue holders. OK, maybe that’s going too far. But it does have boxed corners! If you’re looking to make something a bit special, this could be the ticket. 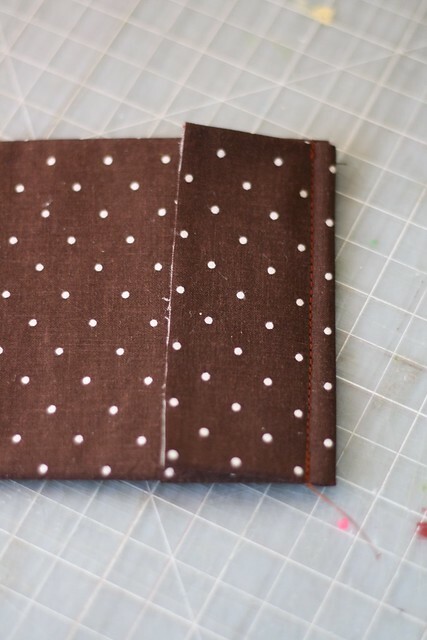 Using 1/4″ seams throughout, stitch the main fabric pieces onto either side of the 1″ wide contrasting strip. Press seams open. 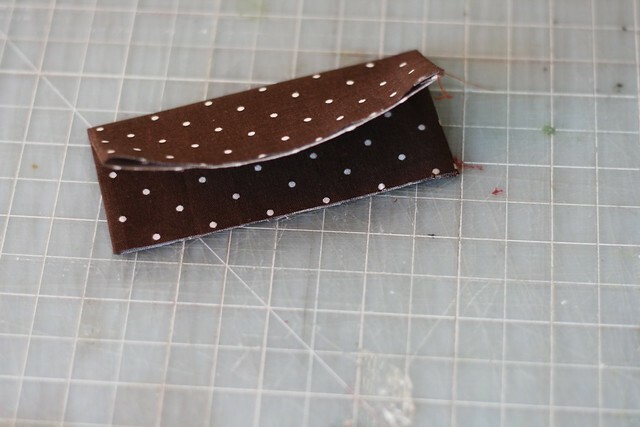 Stitch the 3/4″ wide contrasting strips to each end, as shown. Press seams open. 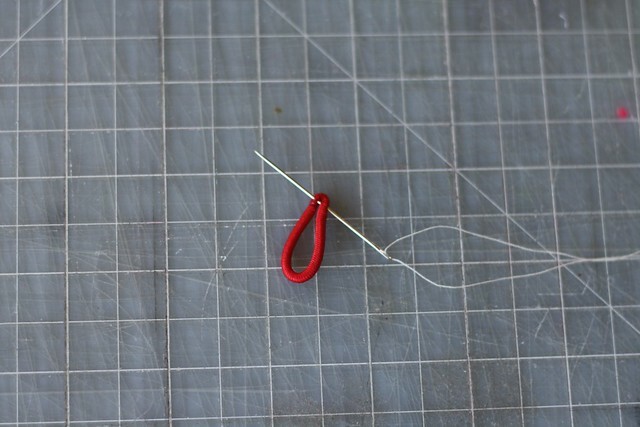 With a needle and thread, pierce the hair elastic in two places, close together, to create a pinch. Stitch through again, to hold the pinch tight. Hand sew the elastic to the very edge of the pieced fabric, half way down one side, facing inwards towards the crosswise stripe. Secure with a couple of stitches. 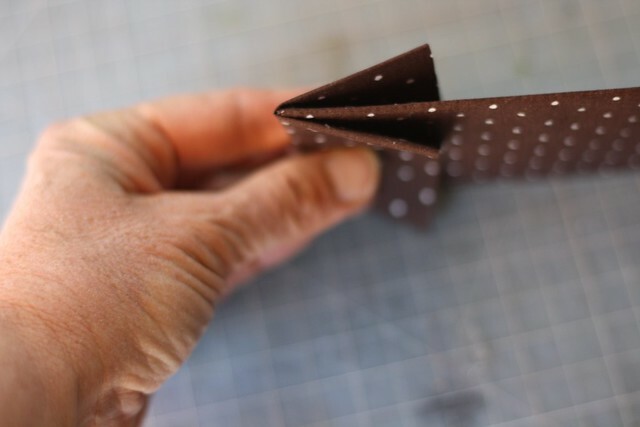 Place the pieced fabric and the lining fabric right sides together, and sew around the edge, leaving a 2-3″ gap in the middle of one long edge. Backstitch a few times over the hair elastic as you pass it. Don’t clip the corners! 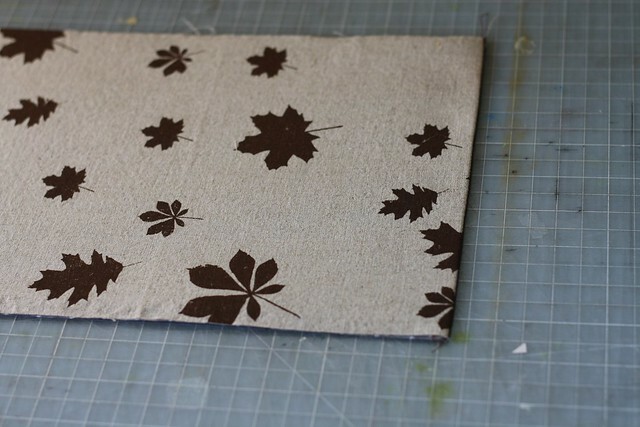 Turn the whole thing right side out, using this method for getting nice sharp corners. Ladder stitch the opening closed. Press. 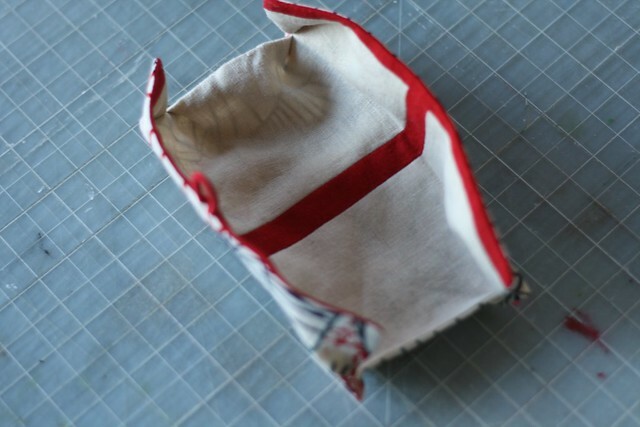 With the lining side out, fold the edges to meet in the middle. Check that your stripe is lining up with itself nicely. Press the two folds. Now we’re going to box the corners. Pick one of the four places where your newly pressed fold marks hit the edge. 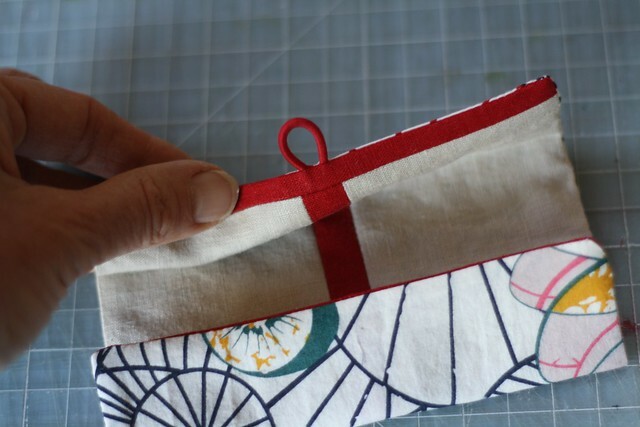 Create a point there by folding down the fabric on each side of the fold. 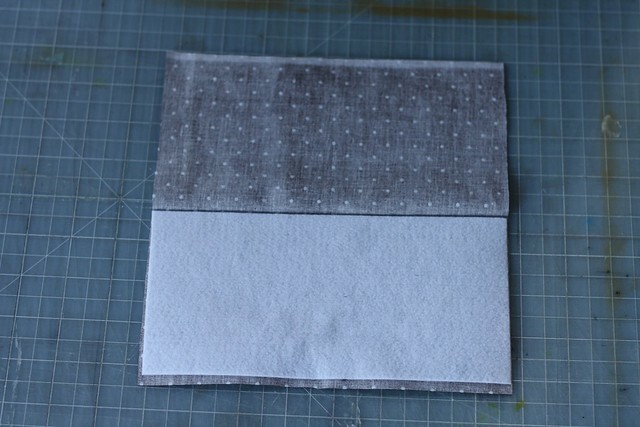 With a soluble marker, draw a line perpendicular to the original fold mark, 3/8″ down from the point. Stitch along this line. Repeat for the remaining three corners. You’ll now have something that looks a bit like a boat. Turn right side out. 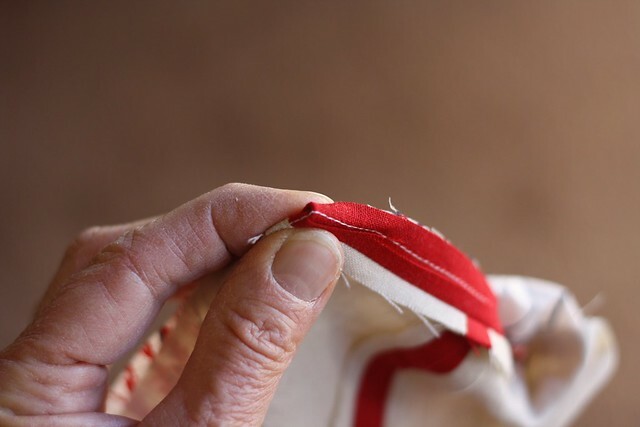 The side seam will be formed by holding the ends of your contrasting strips together, and bringing them down to meet the edge. Ladder stitch the side seam closed on each side. Ladder stitch about 1″ of each end of the opening, so it doesn’t gape so much. Sew on your button. Add a mini packet of tissues. Admire your work. Gesundheit! My one little word for 2014 is wonderful. I want to stay full of wonder at the amazing and beautiful world I live in. I want to notice things, big and little. 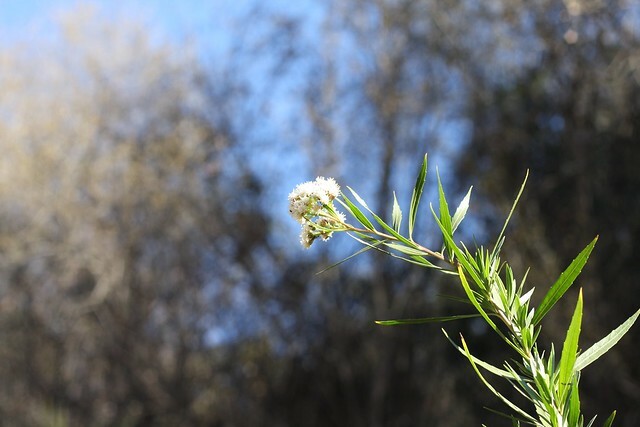 Find beauty in the everyday. I want to be ever-curious. Ever-grateful. Ever-present. And I want to share the wonder, with photos and words. 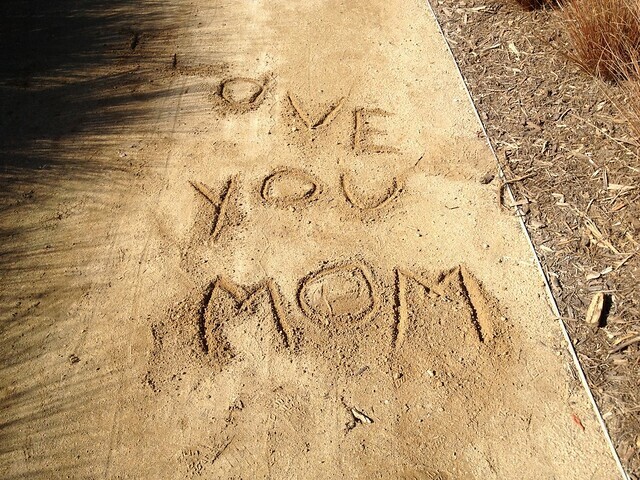 This is my word. Wonderful. At first, he said he didn’t want to go anywhere too steep. But then he urged me to the summit, when I might have turned back earlier. We got a great workout and the view was lovely. A perfect way to start the year.